www.XtraGist.com: ASUU Strike: Who is Losing? 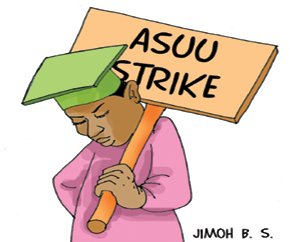 ASUU Strike: Who is Losing? Asuu is on strike and students are sitting at home idle and wasting their time but lecturers are teaching in private universities and earning good money. Nigerian students wake up to reality and lets us resist asuu and their selfish agenda. The lecturers are lecturing in private universities and polytechnic, many have travelled abroad to further their study but you students are just sitting at home pinging on BB, 2going, facebooking and wasting time. Wake up!!! The earlier the students realise these the better for us,Yes Nigerian schools are not rated among nothing but we still have good brains,Asuu lecturers are too greedy.The said money they are asking for is for their personal benefits quote me.I can swear to you that when the government gives them all those billions they would share the money and that would be just it. Who is decieving who? Would that stop them from selling costly textbooks? Would that prevent sorting? Most of these lectures teach in more than 3 schools,yet they are complaining. Govt is not the better person here but they don't care about us! God will punish all of them one by one! I Agree with u pple but d only language FG understand is strike action, Its culd hv been a more reasonable action If d 2 say such action is also used 2 address sovereign of student on our higher institutn such as unconducive environment, inavalability trainning aids,security of life n property, maltreatment, imposure of handouts, immoralty and soon, Don't blame them put blames on ur senates n house of rep, they shared more dat little amount in a year.